Whether you have celiac disease, gluten intolerance or another reason to need a gluten free diet, having dietary restrictions can make enjoying a date night out on the town a little more challenging. Thanks to the increase in gluten free restaurants over the past few years, though, it's more than possible to enjoy a gluten free date night; it can also be downright delicious! Today, I thought I'd round up some of my favorite gluten free date night restaurants, limiting my choices to chain restaurants that can be found in multiple locations around the United States. As always, the quality of a restaurant's gluten free food and protocol can vary by location, and I always suggest calling ahead of time to ask about a restaurant's celiac knowledge and staff training. 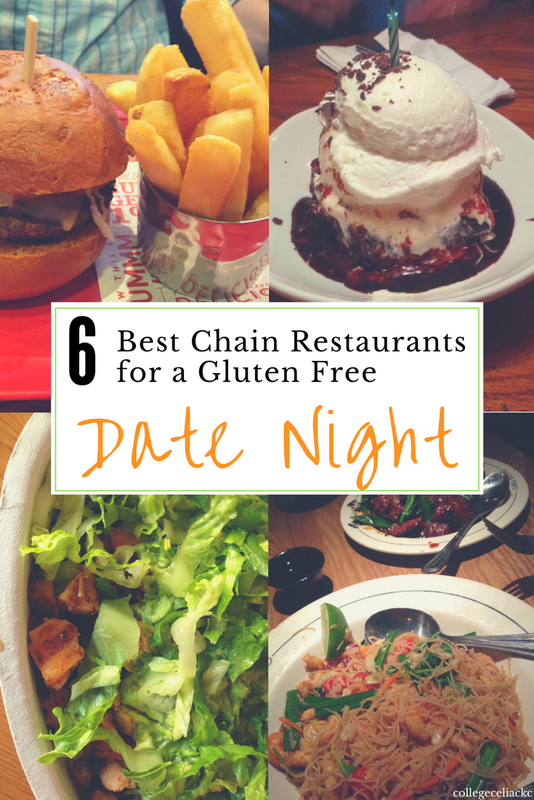 However, this list contains six of my favorite gluten free restaurants for fun date nights, roughly ordered by price/fanciness. Whether you need cheap date night ideas, a date restaurant for an extra-special night or just a gluten free restaurant that everyone can enjoy, these six date night restaurants are exactly what a tasty relationship needs. If you're looking for a cheap date night that'll still be packed with flavor, Chick Fil A is one of my favorite choices. 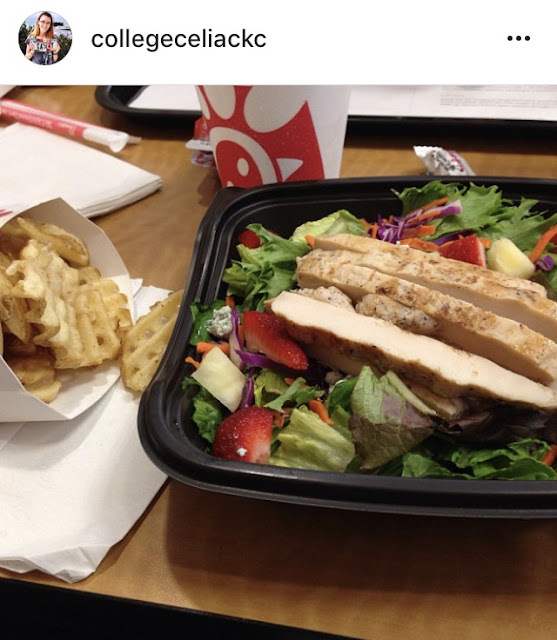 As I've shared before, when I'm craving a "balanced" meal - AKA a salad in one hand and waffle fries in another - Chick Fil A always delivers. Chick Fil A offers a variety of gluten free options, including fries (be sure to double check that your location uses a dedicated fryer), salads and grilled chicken. Chick Fil A also recently added a gluten free bun that comes in a plastic package (yay for no cross contamination!). Just order a grilled chicken filet, toppings and a gluten free bun, and you can make your own gluten free grilled chicken sandwich. I typically order the Grilled Market Salad, which comes with grilled chicken, fruit and greens, along with a small order of fries. The food always tastes fresh and is delivered quickly, which makes Chick Fil A an ideal date night restaurant if you need to catch a movie or rush off to another romantic adventure after eating. While Chick Fil A cashiers haven't always been well versed in celiac disease or gluten free meal orders, I've never had an issue when ordering off the GF menu. My dates have never complained about the restaurant choice, either! Another fun date night restaurant when you're rockin' a strict budget is Chipotle! (In fact, all the first dates I've gone on thus far started at Chipotle...). Whenever I order from Chipotle, I tell workers that I have a gluten allergy and ask them to wash their hands and change gloves. I've never had a problem at any of the locations I've visited, though some employees are better trained about the gluten free protocol than others. Since Chipotle's plan to add a wheat-filled dessert to their menu seems to have stalled out, the only gluten in Chipotle's menu is in the tortillas. When ordering a burrito bowl or salad, though, I'd recommend asking for lettuce and cheese from the back to reduce the risk of cross contamination, since those items are usually added with the workers' hands, instead of a spoon. Chipotle items made with corn are also questionable in how safe they are for celiac customers (and the picture I've included below with chips is from a few years ago). If you love the Chipotle goodies that are gluten free, though, and live near a Chipotle location that knows how to do gluten free right, Chipotle might become your new favorite date night restaurant. Eating out gluten free and a craving a little fancier of a date night dinner? Then PF Changs is your edible soul mate. 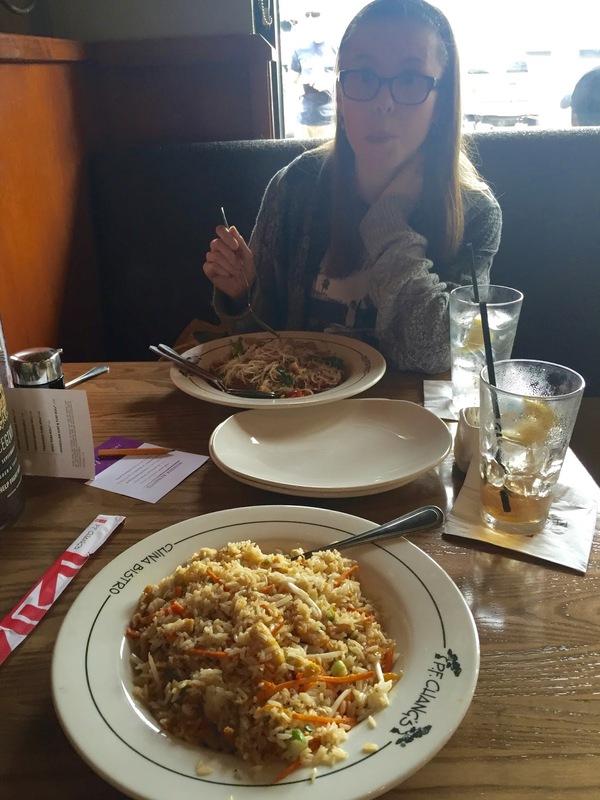 I tried PF Changs for the first time a little less than two years ago, and was blown away by their gluten free protocol. Besides having a gluten free menu full of tasty options - ranging from chicken lettuce wraps to my personal favorite, the street noodles with shrimp, chicken, rice noodles and veggies - PF Changs uses separate woks and prep stations for all of their gluten free orders. As an added bonus, PF Changs delivers all gluten free meals on different plates, so it's easy to identify a gluten free order. PF Changs can also be the secret weapon to a fun date night because of the shareability of all of the meals. Many of PF Chang's gluten free meals are identical to options on the regular menu (minus the gluten, of course! ), so it's easy for your date to order what they'd enjoy anyway from the gluten free menu instead. As a result, not only can you split meals and enjoy a little taste of everything, but you also don't have to wait to kiss goodnight until after your gluten-eating date has brushed his or her teeth. ('Cause nothing ruins a good date night like getting glutened!). If I had to sum up Red Robin in one word, I’d have to go with their infamous commercial ending: “Yummmmm.” I’d never tried Red Robin before my celiac disease diagnosis (I know, crazy), but I’m very happy to have their gluten free burgers in my life, especially when I want a fun date night restaurant that’s more high end than fast food but still casual. My biggest complaint about Red Robin is that, at least in the locations I’ve tried, the gluten free menu is found online only. As a result, I highly recommend looking over the menu and deciding on your order ahead of time. Besides that one caveat, Red Robin usually earns a 10/10 when it comes to gluten free food. I usually order their turkey or chicken burger with a gluten free bun, lettuce, tomato and avocado, though I’m hoping to try their new salmon burger sometime soon. Of course, you also can’t forget about the endless gluten free fries. As usual, you’ll also want to double check that they have a dedicated fryer to make the gluten free fries (all the locations I’ve visited so far have had one). In my experience, the gluten free bun (I believe they use Udi’s) is always soft and warm, the fries are made fresh and not super oily, and the burgers are stacked high and big enough for two meals. For burger lovers, Red Robin is the ultimate allergy friendly date night restaurant. I saved my fanciest/priciest date night restaurant for the near end of this list, but Outback definitely deserves to be included in this round up. I will say that the staff’s level of gluten free awareness definitely varies by location, and I've had one bad experience with an Outback in Grand Junction, Colorado. However, every other Outback I’ve tried has been very gluten free and celiac friendly. Outback has its own gluten free menu, with gluten free options ranging from fish to steak to chicken, plus sides like baked potatoes and veggies. As an extra bonus, they also have an AMAZING gluten free dessert: an epic flourless brownie. (It does contain nuts and dairy, unfortunately, but if you can tolerate those allergens, the Thunder Down Under is one of the best gluten free restaurant desserts I’ve ever tried). As with all restaurants, I highly recommend calling your location ahead of time to check their gluten free familiarity and discussing your gluten free needs and the importance of avoiding cross contamination with your waiter or waitress. Nonetheless, if you want a restaurant for a special occasion and need to eat gluten free, Outback Steakhouse is one of my favorite go-to’s. This last “bonus” date night restaurant is a bit of a cheat because Whole Foods Market is more of a grocery store than a restaurant. However, if you live near a Whole Foods Market with a hot bar and you and your date love trying new cuisines, dinner at Whole Foods can be as delicious as it is fun! 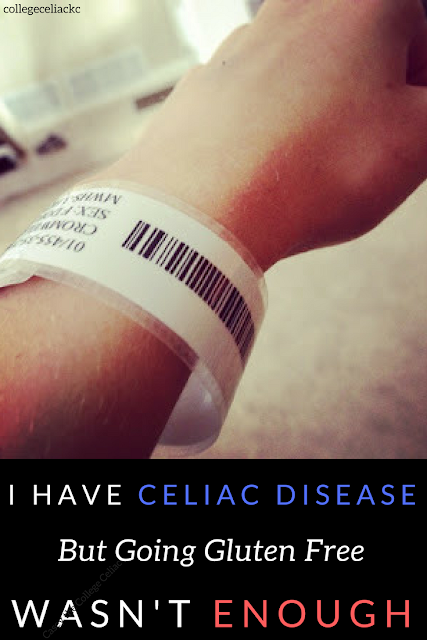 As I’ve shared before, people with celiac disease do need to be careful when eating from the Whole Foods hot bar and pay attention to possible sources of cross contamination. However, the Whole Foods hot bar does usually contain plenty of delicious gluten free options - ranging from comfort foods like chicken and mashed potatoes to soups to (my personal favorite) Indian - and this would be an easy way for you and your date to both leave full and happy if you have very different taste buds or dinner preferences. I can also attest that the only thing better than eating at the Whole Foods hot bar is eating the leftovers...so consider this a two-for-one dinner and don't forget to take a doggy bag home with you! It’s impossible to deny that having celiac disease or other dietary limitations can make dating a little more complicated, whether it’s because your date needs to brush his or her teeth before kissing you or you have fewer date night restaurants to choose from. As this list shows, however, there are still plenty of options for eating out gluten free with your significant other, ranging from cheap date night eats like Chick Fil A to more fancy restaurants like Outback Steakhouse. Like this post? 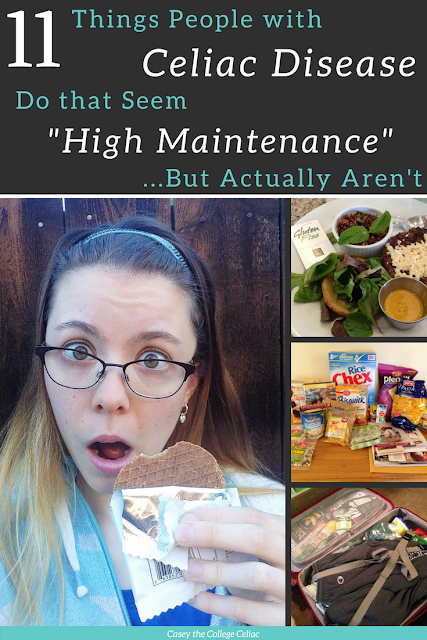 Tweet me some love by clicking here: "Don't let dietary restrictions interfere with romance! Today, I'm sharing my top 6 chain restaurants for an epic #glutenfree #datenight. Which one is your favorite? Read about all of mine here --> http://bit.ly/2GJwsUO #celiac #allergyfriendly #glutenfreediet"
Not to mention that, if all else fails, there are tons of gluten free recipes you can whip up for a romantic dinner in...and at least when your date night restaurant is your own kitchen, you can enjoy a side of Netflix with your delicious meal! What's your favorite date night restaurant? Have you tried and loved eating gluten free at any of the restaurants I listed above? Tell me in the comments! I tried Burger 21 recently. I think they were very good. But I was glutened, either by them or by the Fruitopia bar I had the same day. The bar's website states clearly that it isn't celiac safe. But the statement was hidden on their website and the staff didn't mention it. Nor was it on the box. Evil. You know how they have "not a low calorie food" on diabetic candy? They should have one that says "not a gluten free food." Simple fix, no? Locating safe food can definitely feel challenging at times. I hope you felt better soon!